The Charleston City Attorney's Office strives to serve the City of Charleston by dispensing legal advice to the Mayor, City Council and various City departments and the representation of the City in court actions; to represent the City as a municipal corporation in development transactions and operational matters, as well as being responsible for certain filings and revivals of liens and the drafting or approval of proposed ordinances, resolutions, deeds, leases, contracts, legal pleadings and briefs. for bringing legal actions on behalf of the City of Charleston. all cases brought before such court. How do I file a criminal complaint as the victim of a crime? which is located on the Court Street side of City Hall. Their hours of operation are 9 am to 4 pm, Monday thru Friday. I think I have been scammed. How do I report it? you may visit their Web site, http://www.wvago.gov/takeaction.cfm. How do I acquire a lawyer to represent me? 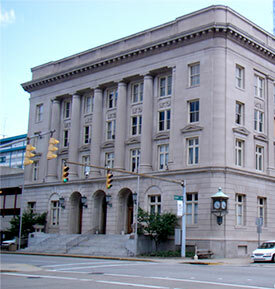 the Kanawha County Public Defender's Office. They may be contacted by calling (304) 348-2323.
or you may send a request online by visiting http://www.wvbar.org/referral.